Some of you may already know this track. I played it a lot this summer. 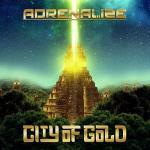 So now that I reached 60.000 likes on my facebook-page, I would like to give you my new solo-track 'City Of Gold' for FREE!